his show is part of Pepsi Rock Series powered by Xfinity. Visit The Village Tavern (378 Main St, Ridgefield) the night of the show and receive a complimentary glass of house wine or draft beer with the purchase of an entrée! Media partner for this event is 99.1 PLR. Jefferson Starship rose from the ashes of another legendary San Francisco band, Rock and Roll Hall of Fame Inductees, Jefferson Airplane. Founder Paul Kantner (who died in January 2016 at age 74) knew that combining powerful creative forces, personalities and talents could create something far greater than the sum of its parts. 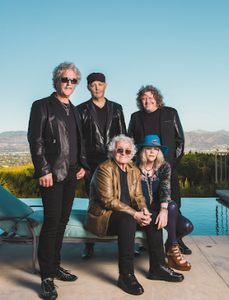 Between 1974 and 1984, Jefferson Starship released eight gold and platinum albums, twenty hit singles, sold out concerts worldwide and lived out legendary rock and roll escapades. In the spirit of Kantner, who said, "Jefferson Starship was my creation...and it has this nice fluidity about it that allows any number of people to come in and do things with whatever Jefferson Starship is," today's Jefferson Starship remains dedicated to breathing new life into the living catalog of the Jeffersonian legacy, going to the edge, pushing the sonic boundaries and staying true to the original spirit of the music. For tickets ($55), call or visit the box office, 203-438-5795 or go online at ridgefieldplayhouse.org. The Ridgefield Playhouse is a non-profit performing arts center located at 80 East Ridge, parallel to Main Street, Ridgefield, CT.